Let’s look at the little things that add up by the time you zero in on the action. From a lot of trial and error, I can offer up the following pointers that have proven to bring pretty consistent results when it comes to “closing the sale.” As always those results tend to materialize over time with a bit of practice and, whether intuitive or not, each is reasonably straightforward to perform. Keep in mind, you have other options that may suit you better. Set the hook before each cast. You heard it right, and I catch an average of one or two fish per outing this way. 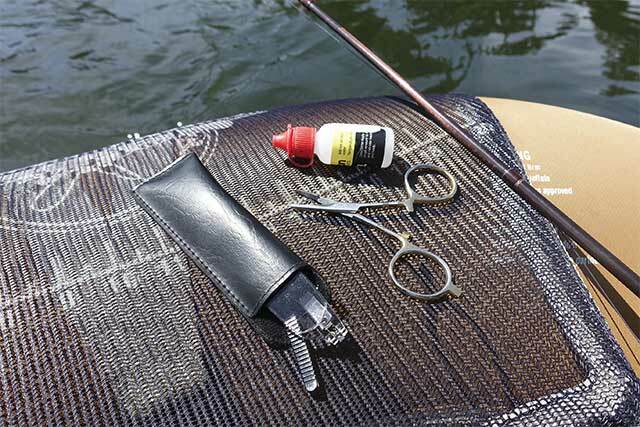 It’s very easy—just do a hook-setting motion every time you pick the line up out of the water to recast. Trout love to follow retrieves all the way in, then grab at the last moment. I always pause a second before picking up and then set the hook as if I got hit. A surprising number of times something will actually be there with its mouth around the fly. On any miss, don’t pick up right away. Instead, stay the course with your retrieve and hold steady for a follow and second take. (Remember that hook set when you recast!) In my experience, making the same cast can bring on a subsequent strike, and I’ve taken my share of trout this way. However, as a rule of thumb, the larger the fish and the more shallow its location, the lower your odds are on second cast. I usually make the second cast, move on, and then come back ten or fifteen minutes later for one last visit. That’s a good way to find either success or closure. Hint: Taking that second shot works quite well when trolling. On any hit or miss, do an about-face and troll right back over the same area. I find the odds to be even better for this method given the depth involved, since they’re anything but bashful in that zone. Unattached or unattended, either can be a costly mistake when water is involved. Playing fish away from the reel. For smaller to average-size fish, I cannot tell you when I last used my reel to play and land a trout, lake or stream. By hand one can take in line much more quickly and also constantly adjust and control the tension depending on how the fish behaves. This is a very simple difference in method that brings great results and doesn’t take tons of practice to get good at. Note that when the big one calls your name, all bets are off. Go straight to your reel and let it run when it wants. Here the threat of a break-off is much greater, and you’ll want to afford the fish as much shock-absorbing latitude as you can. Like a lot of things, I had to learn this the hard way a few times. My worst was on the Yakima River when, without thinking, I elected to play the fish of a lifetime away from my reel out of habit. According to statistics, if I fish the Yak regularly I’ll have another shot at one of those fish in ten years. I’ll be sure to put it on the reel when that happens. Following stubborn fish while hooked. 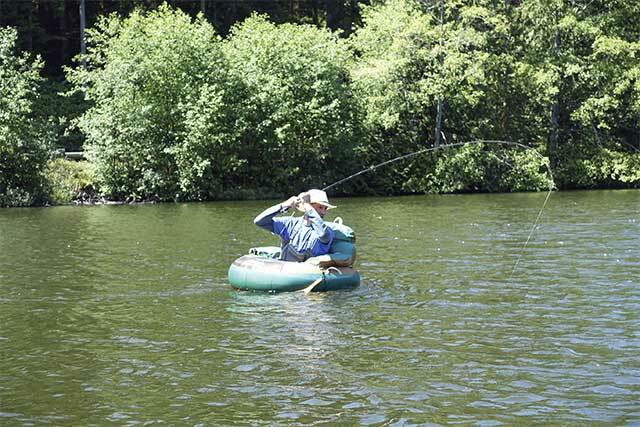 Mostly for float tubers, take advantage of your mobility by moving toward any trout that refuses to give way in your direction. I have no problem going to them whenever necessary. The sooner I can fight the fish from a close distance, the more control I have during battle. Landing from beneath. I prefer to land fish from underneath my float tube when it’s an option. It takes a little skill but is well worth it in terms of avoiding a last-second loss. From directly below, you can usually lift the fish straight up to the edge of your tube with the net waiting a foot or two away. At the last moment simply make a swift scoop as the trout nears the surface. I can do this most of the time with relatively little fuss compared to landing it from an outward position. Never set your rod down to multitask. The issue with that should be obvious, unless you have yet to catch your first fish. Along the same lines, be conscious of anything not attached to you or your boat, especially your rod and reel. I have a few hundred bucks in equipment resting at the bottom of several lakes. I know right where it all is. 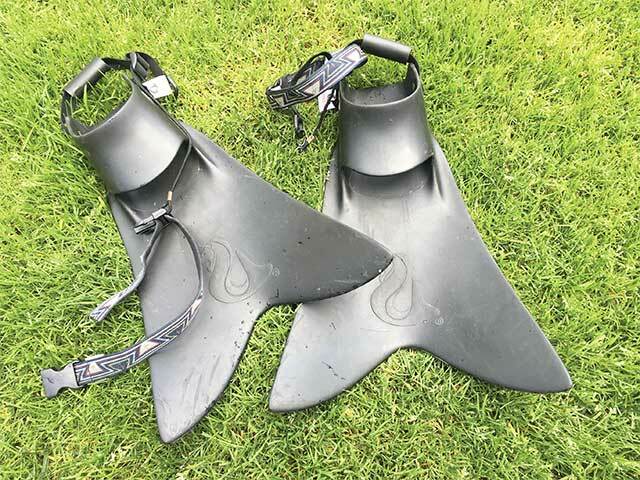 for Force Fins or similar costly gear make for great peace of mind. Check rod connections often. The only thing better than watching a section of your rod fly off during a cast is hearing a female connection crack during a cast. I have written a couple of warranty checks from this one. Check your fly often. One of my worst pet peeves, I really hate wasting twenty or thirty minutes out there thinking I was presenting with a functioning hook, only to find it fouled up somehow. Always tether expensive fins. I’ve never lost a Force Fin and never plan to. Never overinflate. That applies to everything. When another angler is successful, ask about everything except the fly he is using. Not because it’s a secret—you simply don’t need that information. For what it’s worth, I have yet to tell someone what fly I’m using or its color, and then watch them proceed to knock the lights out. Remove your fly before you correct tangled leader and tippet. Nine out of ten times it’s a lot faster to do this and just tie it back on. 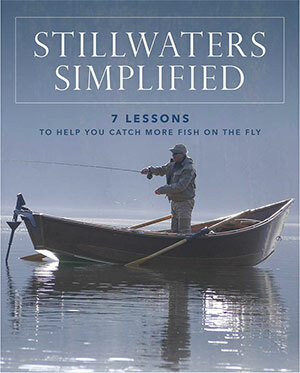 Excerpted with permission from Stillwaters Simplified: 7 Lessons to Help You Catch More Fish on the Fly (Stackpole Books, August 2017). All rights reserved.